Variable valve timing. It's not just for V-TEC, yo. It hasn't proliferated in the bike world, and Ducati is bringing it to its new and overtly Italian-named Testastretta 1198cc twin with "Desmodromic Variable Timing", or DVT. Naturally, Ducati is making the addition of VVT about performance. The engine is an updated variant of the Testastretta currently found in the current Multistrada, and with the new valve tech, it's putting out 160 horsepower at 9,500 RPM and 100 pound-feet of torque at 7,500 revs. That's a boost of 10 hp and 9 lb-ft over the existing mill, and it gets a nice midrange boost, with 59 lb-ft available at 3,500 RPM and 74 lb-ft spanning 5,750 to 9,500 revs. All good, but it's also about fuel economy. Every motorcycle maker is going to have to start adding this and other tech to meet new Euro emission regulations, and Ducati is claiming that the VVT setup is good for an 8 percent boost in fuel economy while emissions are reduced with a new secondary air system that improves combustion. 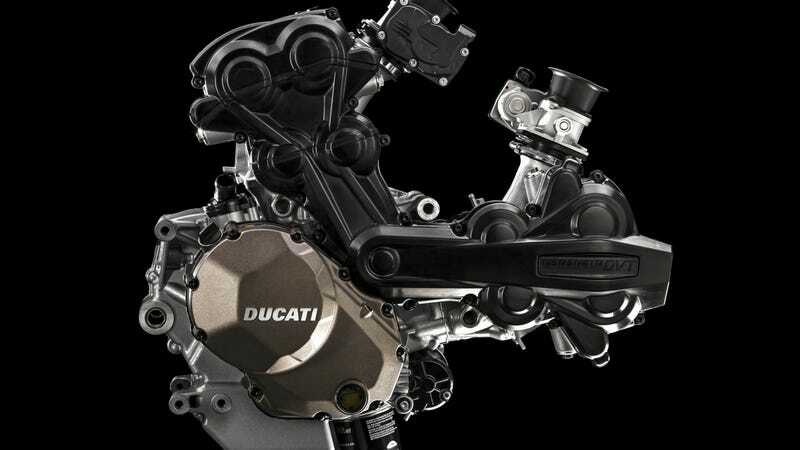 Like the systems we've been enjoying on four wheels for a couple decades, the Ducati system adjusts the intake and exhaust camshafts to boost efficiency. The DVT increases the amount of intake and exhaust overlap through oil pressure and cam sensors at higher RPMs and reduces the amount of energy necessary to pop the valves open at lower speeds. The desmodromic valves don't use springs and combined with repositioned fuel injectors and a smaller cam phaser, the engine is both smaller and lighter than its current 1198cc twin. To hear Ducati tell it, it's the first motorcycle brand to bring it to market. That's not entirely true, as Kawasaki offers it on the 1400GTR and Honda fitted a reworked version of V-TEC on the sixth-gen VFR800.